In the days when I worked at a major theme park one of my jobs was to drive the lovely train which gave guests a scenic ride around a section of the park. This was one of the more peaceful aspects of my work and gave me the opportunity to talk to the guests and other staff and to generally have an enjoyable an uneventful day (apart from the occasion when my colleague locked me in a spider invested cupboard in the station and left me there for several minutes). The train rarely broke down and the atmosphere was great with the children loving the colourful locomotive. Some days, however, did not go according to plan. The train took its journey past a lovely lake, some thrill rides and through a wooded area. Inevitably there was some local wildlife which I would regularly encounter along the way. One of animals I would see was a rabbit who appeared to live next to the upright of a roller coaster that I passed en route. I christened him Roger and would point him out to the children via my PA system as we passed him. There were also several squirrels which I would see gathering food and jumping around the trees. It never occurred to me that these creatures might present a problem until one actually did. It had been raining and so the tracks were wet and I had stopped on a slight incline. The wheels of the train were spinning and I had no traction to pull me up the hill. In short, I was stuck! I then had the embarrassing task of radioing the control centre to tell them that I had a ride shut down due to an emergency stop to avoid a squirrel! I had a train full of stranded passengers and several upset children. To make matters worse the rear of the train was still on the level crossing and so the gates could not rise and so guests were prevented from accessing the section of the park on the other side of the crossing. I then discovered that there were no staff available to run to my assistance as they were all attending a breakdown at the log flume! Close to where Roger Rabbit lived there was sizeable oak tree. As I was redecorating my house at the time I often imagined what beautiful oak furniture could be made from that timber but I never though the tree would be a contributory factor in a ride shut down. What I had not considered was that the tree was dropping acorns all over the track and that the squirrels were busy collecting them. One day I came around a corner to find a squirrel sitting on one of the rails. He was so wrapped up in gathering acorns that he clearly had not noticed that a rather large diesel locomotive was bearing down on him. For the comfort of the guests I should have kept rolling and risked hitting the squirrel but I instinctively took my foot off the dead manâ? ?s pedal and stopped the train. The stupid squirrel then ran off and so all should have been well but when I attempted to restart the train I realised I had a bit of a problem. My only recourse was to run all of the way back to the station to get a bucket of sand, return to the train to put sand on the track in the hope that I could gain some traction. My only alternative would have been to disengage the break, let the train roll backwards and then try to restart from lower down the track but this would have been potentially hazardous and I wanted to avoid that scenario. Thankfully my plan worked and I got my passengers back to the station safely, if a little late! 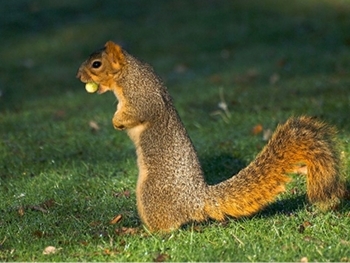 Who would have thought that a few acorns and a squirrel which was clearly deaf could have caused such a hassle? I resolved that next time the squirrel would be toast but thankfully it never happened again!